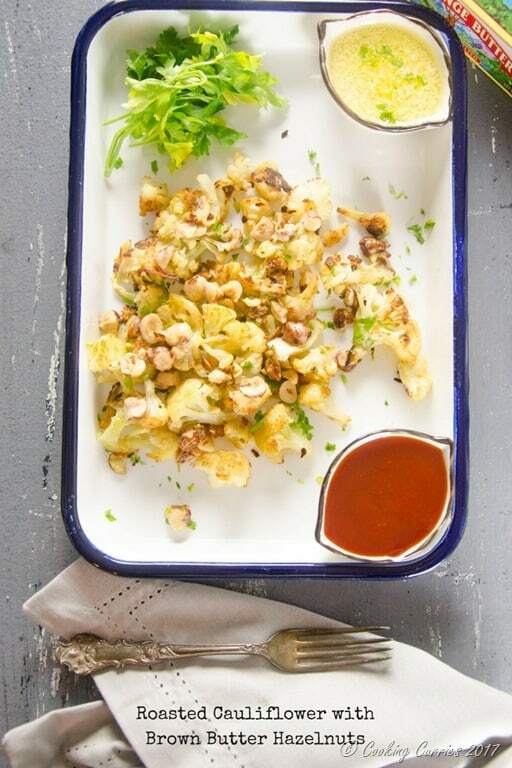 A great appetizer or veggie side, whether it is for the holidays or just everyday dinners – this Roasted Cauliflower with Brown Butter Hazelnuts made with Real California Milk Butter. A great vegetable side will come handy anytime. Whether it is a quick weeknight dinner you want to put together or whether you are entertaining, a crowd favorite veggie side is a must. 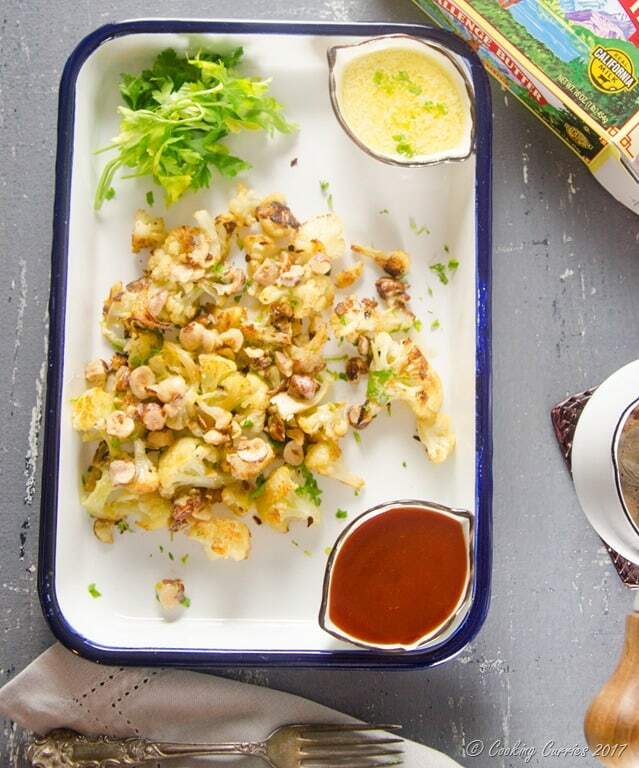 What better to use, than a cauliflower and how better to make it than roast it. Make it a little fancy by topping it off with brown butter hazelnuts and you are more than good to go! 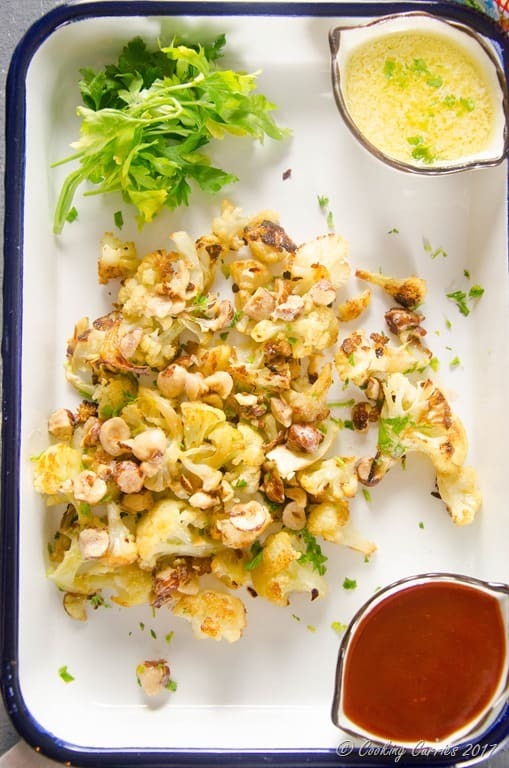 This dish wouldn’t take a whole lot of time as cauliflower roasts pretty quickly and while it is roasting, you can brown some butter and toast some hazelnuts in it, in less than 5 mins. All this can happen when the main dish is almost done and someone is setting the table for dinner or enjoying a glass of wine. The butter used here for the brown butter has the seal of Real California Milk. Now, lets talk about why that is important. Real California Milk products are all real food made by real families and what more do we want, other than to look for that seal in any dairy products you buy. And there is no better time than now to support Real California Milk’s initiative called Seals for Good. This campaign has been supporting families affected by Hurricanes Irma and Harvey and more recently the wildfires in California. How this campaign works is that every time you or anyone share a photo of Real California Milk seal on social media using the hashtag #SealsforGood, Real California Milk will donate $5 to the Great American Milk Drive. The Great American Milk Drive, in partnership with Feeding America, has delivered more than 1 million gallons of milk to food banks across the country since 2014 to help families get the nutrients they need. So, what are you waiting for? Go Spot the Seal and share away to help all these families in need. No purchase necessary. 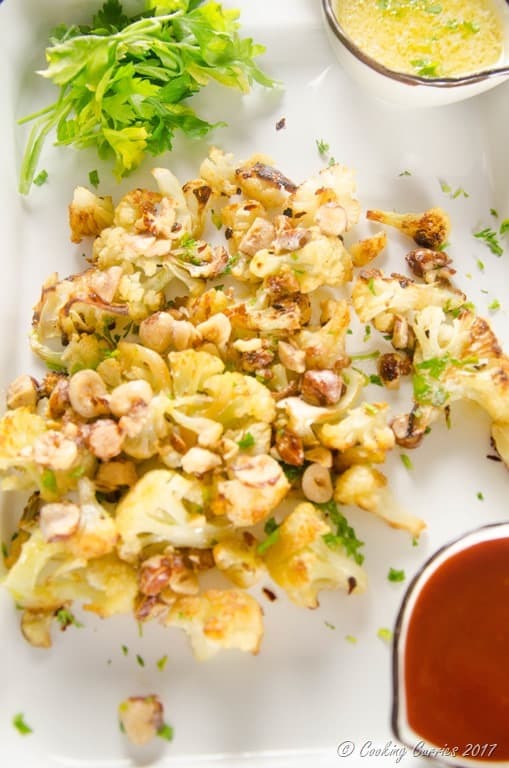 Toss the cauliflower florets with olive oil, salt and red pepper flakes. Roast for 20 mins or so, turning once, till it it browned. Brown the butter and add the hazelnut pieces to it. Remove from heat and keep aside. Pour this over the roasted cauliflower and serve immediately. Thanks for sharing this Yummy! recipe with us. My Mom Loved this, when I made this for her. Thank you ?? Glad you loved it ?